A SHOCKING new documentary has exposed the number of people who hold down jobs - but sleep on the streets. Channel 4's Dispatches, to be shown on Monday, shows a security guard at Bond Street's Prada who has no home to go to after hours. 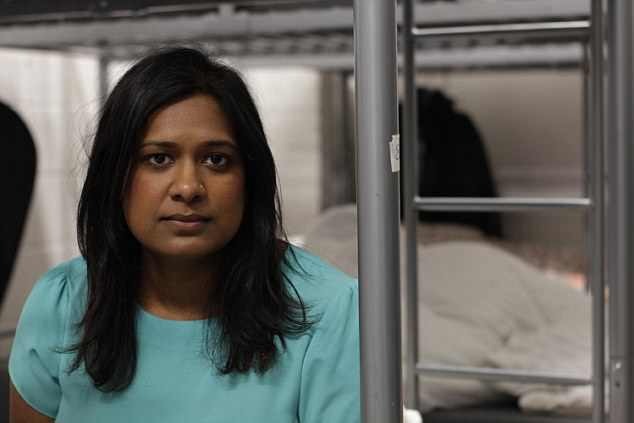 Reporter Datshiane Navanayagam went behind the scenes inside two homeless hostels to uncover the stunning truth. Kallum sleeps rough on London's streets - and he's not the only one. The programme will reveal tens of thousands of people around the country cannot afford to rent a place of their own, despite having a steady job. Often they work for high-end retailers, or major brands. The show claims to expose the plight of low income wages and spiralling rent costs. Kallum says he is paid £8.50-per-hour, more than the minimum wage, by his bosses at security firm First Call. When his shift is up he sleeps on pals sofas or seeks refuge in homeless shelters. He tells the show he's like Superman, adding: "By day I’m a security guard. At night I’m homeless. "I never have enough sleep for the next day or feel refreshed enough to get up and go to work." Another woman, who calls herself Emma, says she became homeless when her marriage ended, despite keeping her job as a teacher in adult education. She said: "I have been asked to look for deposits that I can’t actually make. "I have been requested to pay about £2,000. Nobody keeps £2,000 on hand just like that." Emma admits to washing in a McDonald's loo. Dispatches claims many left on the streets are on long waiting lists for social housing. Connie Cullen from Shelter told the show: "We are at crisis point. We really need social housing available to people on low income. "Without that we are going to continue to see people who are in work and who are homeless." Shelter says 300,000 people are officially registered as homeless in the UK.